Global data market is growing rapidly and it will hit $18.2 billion in 2018 - reveals “Global Data Market Size” report, which is the world’s first study about data market. Spending for data is growing because information about internet users is a petrol for programmatic campaigns. Check the world’s largest data markets and see estimates and forecasts for data, programmatic and display markets for 28 countries globally. Data has become the currency of the 21st century. There is a significant upward trend that we can notice at least since 2016. Need for data is growing simultaneously with the rate of digitalization. In highly developed countries, such as the US or the UK, there is a big awareness of benefits from the processing and monetizing data. This is why firms from those countries are more likely to buy and sell data. 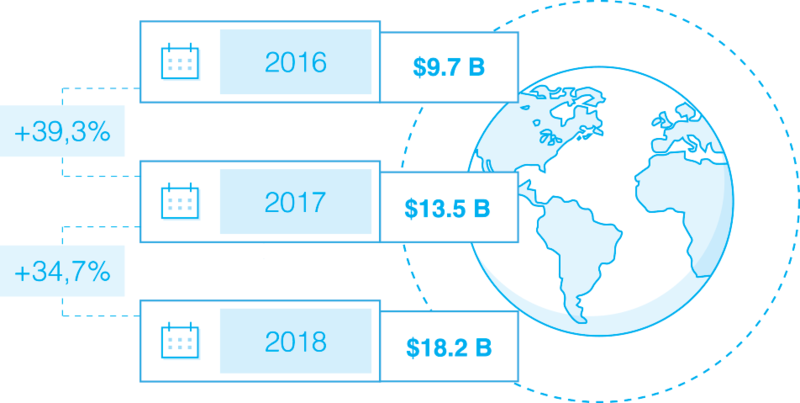 The world's largest data market is the US with an estimated value of $11.4 billion in 2018. Behind the US is the UK market with an estimated value of $1.6 B. The third largest data market in the world is China with $674 M in 2017 and it is going to exceed $1 B in 2018. The Chinese market is also the fastest growing one among the TOP 5 world’s largest data markets with a growth rate of 89.4% in 2017 and 58.8% in 2018. Japan ($713 M in 2018) and Canada ($355 M in 2018) are also among countries with the highest data spend. The marketing industry is the motor of the data market growth. Thanks to information about demographics, interests, and purchase intentions, marketers can significantly improve effects of their programmatic ad campaigns by creating personalized messages and targeting the right audience group at the right moment of their buying journey. The requirement for data is also connected with the fast digitalization of companies. As an effect of that process, many firms are changing their model to data-driven business. In the “Global Data Market Size” report OnAudience.com analyzed 28 markets from all around the world that generate about 90% of the global data spend. We've prepared our own statistical model based on own data and publicly available reports. Get our report about global data market and check estimates and forecast of data markets for 28 countries globally.